Business View Magazine interviews Carrie Rose Pace, Director of Communications for the Greater Richmond Transit Company – best practices in transportation. The Greater Richmond Transit Company, known locally as Greater Richmond Transit Company, is a local, government-owned public service company which operates urban-suburban bus lines based in Richmond, Virginia. GRTC primarily serves the independent city of Richmond and a portion of the adjacent counties of Henrico and Chesterfield. It has 500 employees, and a fleet of more than 175 diesel-powered and CNG-powered transit buses operating approximately 45 routes. Greater Richmond Transit Company uses government-funded equipment and resources principally provided by the Federal Transit Administration (FTA), the Virginia Department of Rail and Public Transportation (VDRPT), and local funds. 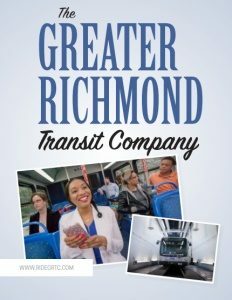 When Greater Richmond Transit Company was first incorporated in 1973, it was solely owned by the City of Richmond; in 1989, Chesterfield County opted to purchase half ownership of the company. Prior to GRTC forming, it operated as a private transit company with different names and under different owners, dating back to 1860 when it was the Richmond Railway, a trolley-based service. 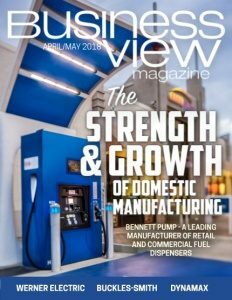 BVM: What’s on tap for the coming year at Greater Richmond Transit Company? Pace: “2018 is going to be Greater Richmond Transit Company’s most historic year. We are launching our first rapid transit service in Virginia’s capital city. It is called the GRTC Pulse. It’s a bus rapid transit (BRT) system – 7.6 miles long, servicing two jurisdictions, the City of Richmond and Henrico County. There are 14 stops along the way. It utilizes transit signal prioritization (TSP). Portions of the route are bus-only lanes, including in the middle of the road and curbside, and we have a dedicated fleet for the Pulse – 10 vehicles. “The BRT buses are built by the Gillig Corporation in California. They are a compressed natural gas, BRT+, 40-foot model. The design allows the vehicle to perfectly dock with a 15-inch-high BRT platform. So, no matter how heavy we weigh down the bus, or how light it is, the bus will meet that 15-inch height to perfectly and easily dock with our platforms. That’s one of the speed factors that you get when designing a BRT system that has platform-level boarding. It was important for those vehicles to have that capability. They are intentionally rubbing a rail – it’s a rubber cushion along the side of the platform – so the bus operator will know that contact has been made with the station with no gap between the platform and the bus. That allows for individuals in mobility devices, or those who may have other challenges, to easily get on and off of the vehicle without having to wait for a ramp to deploy and having to navigate it up or down. BVM: How was Pulse financed, and when will it be operational? Pace: It is funded with federal, state, and local dollars. Greater Richmond Transit Company received a federal TIGER (Transportation Investment Generating Economic Recovery) grant in 2014. We were one of the largest TIGER grants issued that year at $24.9 million. GRTC operates pretty close to the national average for fare box recovery versus subsidy. The national average is 80/20 – 80 percent subsidized, 20 percent fare box recovery. We operate close to a 25 percent fare box recovery, so we are slightly better than the national average. “The system is still under construction, right now, and the contractors are working to finish as soon as possible. We are conservatively estimating a ridership of 3,500 a day. The Pulse system is like the spine of a body. We’re going to let Pulse be that heartbeat of the region, making the body stand firm while supporting the rest of it. BVM: We understand that, in addition to Pulse, Greater Richmond Transit Company has redesigned the rest of its route network. Why? Pace: “The routes in the City of Richmond were developed, essentially, off of the streetcar trolley routes that ran up until 1949, and bus routes really have not changed much in years, because they were modeled after the old trolley routes. So there has not been much change in the way that we move people around the city in a long time, but the city, itself, has changed drastically over time. So, it’s time for an overhaul. We brought in consultants, area stakeholders, and GRTC staff to help us go through a year-long process of redesigning the network. It will go into effect the exact same date that the Pulse launches, this year. BVM: How have you prepared the population for all these changes? Pace: “Change is hard, and this is a major change. So, we are absolutely going above and beyond to make sure that we respond to the needs of the community that we serve, and that includes conducting extensive community engagement from back in 2015, all the way up until now. We held more than 15 public meetings in every city council district to make sure that we provided multiple, in-person opportunities to provide feedback. And those meetings were very well attended; we had excellent press coverage to make sure that the word got out. So that was an important part of public engagement – to make sure that their voices were heard. “Now, we’re in the public education phase. When other cities implemented this type of drastic route re-design, they generally do about a five-to-six-month marketing campaign. And that’s what we’re doing, as well. We started with our riders – the people who need to know most what’s going on. We have on-bus and in-bus advertisements. We updated our website to provide more information including easy-to-digest information at the top, so that, if people just want to get a quick overview of what is going on, they can scan through those bullet points to find out what is happening and how it will benefit them. In January, we started our broader media campaigns, including radio, television, newspaper – all the usual big ways that you broadcast to the broader public, and we also do some targeted advertising on social media – Google, Facebook, and Twitter. “We also have a lot of in-person assistants, called Travel Buddies. You can call customer service and schedule a free practice session. A trained driver will come and pick you up at your bus stop, and will take you, turn by turn, on what your traffic pattern will be from Point A to Point B and then do the reverse. The next thing available is our outreach ambassadors. We’re calling them ‘Friends in the Field.’ They are out at busy bus stops to make sure we have coverage. People can just strike up a conversation with one of these ambassadors and get help. They’re not tied to any one bus or route, so if they start a conversation with a customer on one bus and that customer is connecting onto another, they can continue riding with that customer and continue the conversation to make sure that they have all the resources that they need and the answers to their questions. BVM: Any other new projects or upgrades on Greater Richmond Transit Company’s agenda? Pace: “We are implementing SMART passes with chip technology embedded into the pass; it makes for faster boarding and more reliable fare payment methods. And we’re doing that in the form of a physical card that you can purchase from ticket machines, or from area vendors, or through our online transit store. We’re also deploying a mobile payment app which is another SMART way that you can pay, interacting at our fare boxes – it lets you scan with your mobile device or at the Pulse stations. “Also, we will be deploying a reloadable SMART pass, similar to what most large transit systems and cities have, where you purchase a card that you can load whatever amount you want onto it and reload as you ride. That will be the last phase of the SMART payment upgrade that we will offer in FY 2019. “The next big thing is the ticket vending machines. We have the newest model in the world. It’s made by Scheidt & Bachmann, a European company. We have the top of the line – the newest, latest, and greatest ticket vending machine that they offer. And we’re looking forward to being the pioneer in deploying that new generation of ticket vending machine. “We are growing our fleet away from diesel and gasoline-powered vehicles to compressed natural gas to reduce our greenhouse gas emissions and lower the noise that we cause when we’re operating. We have our own CNG fueling facility, here at GRTC, so we can fuel here without having to go to an offsite location and then pay them to fuel our vehicles. We fuel off of the city’s natural gas line and then compress up to the required PSI to fuel the buses. “We just finished a multi-year, multi-phase bus stop information improvement project. That’s fancy for we have all new bus stop signs. They provide much more information; they’re highly visible; they’re up to VDOT, Virginia Department of Transportation standards; they have reflective material finish on them so they’re much more visible in the dark. “That last thing that we’re doing this year, is updating our mobile app. We have had requests to keep up with the fast-changing technology. You have to do app updates pretty regularly in order to keep up with what your customers expect and need. This new app is currently testing with a small group of current bus riders – about a hundred of them – they’re testing the app, and then, we’ll deploy that app to the public, this year, as well.